Yes it was Christmas, and yes most residents were to be on holidays, and yes many residents are on the planning authority’s email list – so they could have been easily notified of the new development application. This planning authority does nothing to improve its reputation. Were the residents notified directly? NO. Given the seriousness of the development to the local communities, did the planning authority (ACTPLA) see any problems with sneaking the information online just before Christmas? NO. The development Application involves making your way through 91 separate documents. Did ACTPLA think that maybe they could provide some easy access to the most relevant information? NO. Is this a successful case study in how to communicate with local communities? NO. Does this indicate that ACTPLA believes in community engagement? NO. Does this indicate that the ACT Chief Minister through ACTPLA believes in working with the local communities on major projects such as this? NO. Is this a benchmark case of how the new ACT Chief Minister intends to keep his local communities offside? YES. What are the Residents Getting out of this? Does the arrival of the new supermarkets continue the dominance of the usual players? YES. 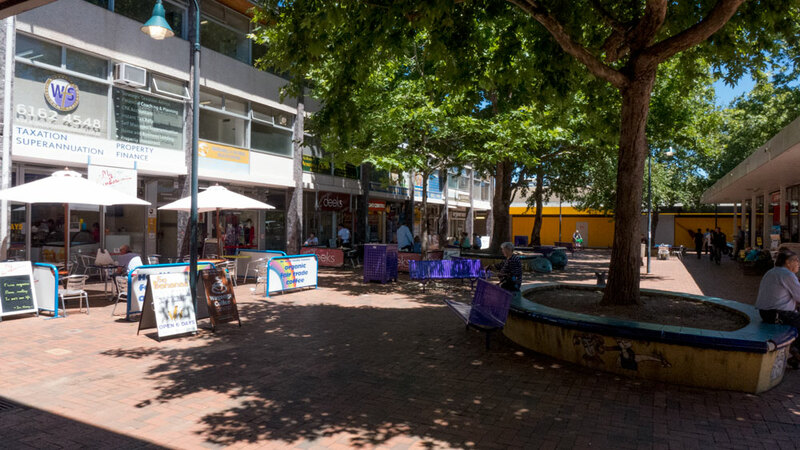 There are many developments planned and being canvassed for the Dickson Precinct. 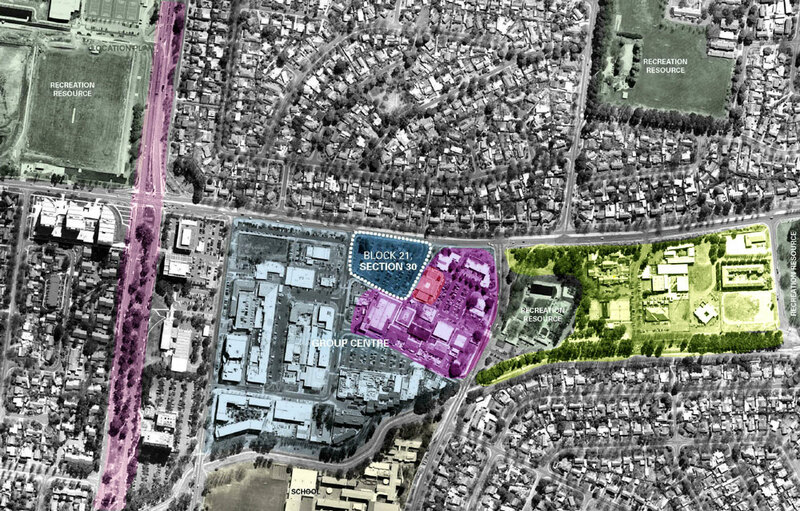 In the illustration below, the main shops are purple and the proposed new supermarket is blue (in the centre). 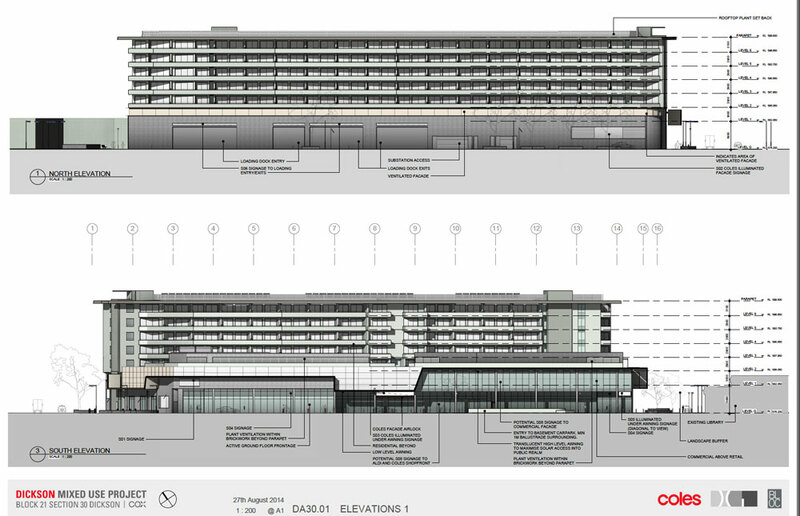 Commercial Centre: Residential developments are planned for the North end and southern end of the commercial centre which is the pale blue area to the west of the shops above. Northbourne Ave: This main avenue is to be developed with more high-rise on both sides with loads more residential and more commercial developments. Residential suburbs: There is a constant flow of development applications for the surrounding residential suburbs – many of these are being contested because of inappropriate design and lack of attention to enhancing the ambience of the suburbs. There has been a complete lack of attention to requiring new residential developments to address current serious environmental and climate change issues. The usual mode of operation for this government through ACTPLA is not to enter into friendly and transparent negotiations with local residents, they prefer instead to demand that residents respond to complicated development applications, and then waste huge public resources in fighting residents through the Administrative Appeals Tribunal. Is it even feasible, given all the quagmire of bureaucracy surrounding developments around Dickson, that residents can expect that they will able to make any meaningful contributions to the latest proposal for new supermarkets in Dickson? NO. This new building is to be another example of contemporary bland architectural design. Such bland architectural boxes have become common throughout Australia. This box will be located beside the last architecturally designed building of any note within the Dickson Precinct. I am referring to the Local Dickson Library designed by Dr. Enrico Taglietti. 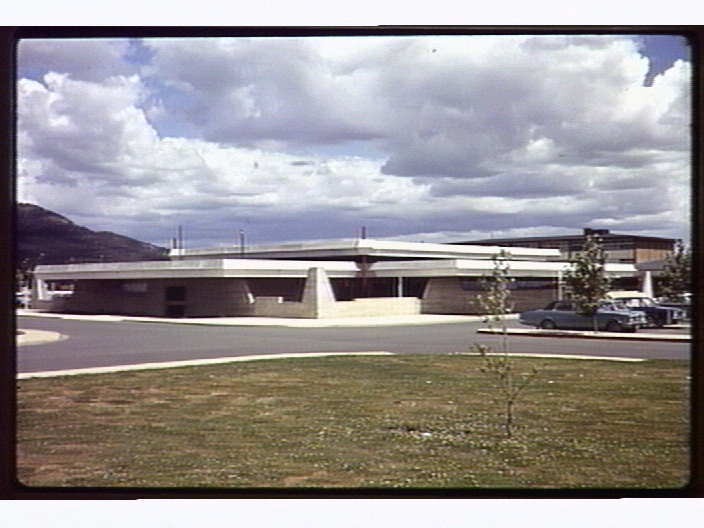 1967-68. The above photo – taken 15 Jan 2015. The one below taken by Peter Wille soon after the building was opened. Do the residents love their library? Yes – click here. What a shame that in years to come people will wonder about the lost opportunity to build a building on the proposed site that could have been a significant architecturally welcoming statement and one that would have included contemporary elements to address climate change, to encourage alternative uses of energy, that would have also incorporated landscape features to enhance the green infrastructure of the precinct. 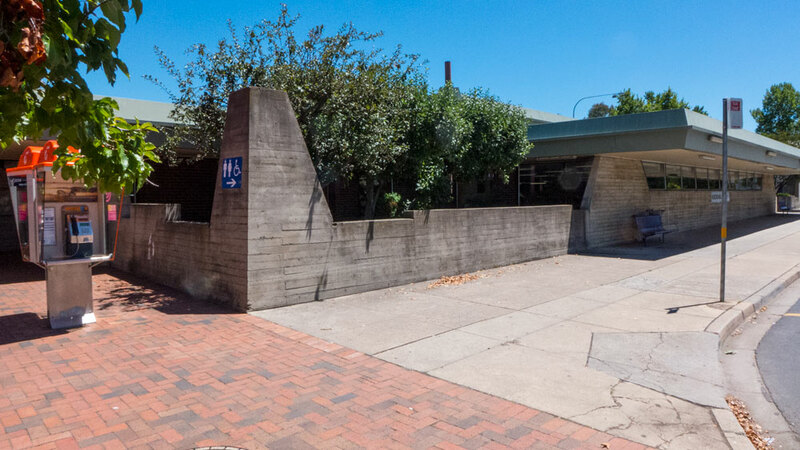 Is there any sign yet that residents are being taken seriously in their wish for precinct planning that enhances the Dickson Precinct? NO – but we remain optimistic! For the record, here’s a PDF of the page with the 91 documents – click here. 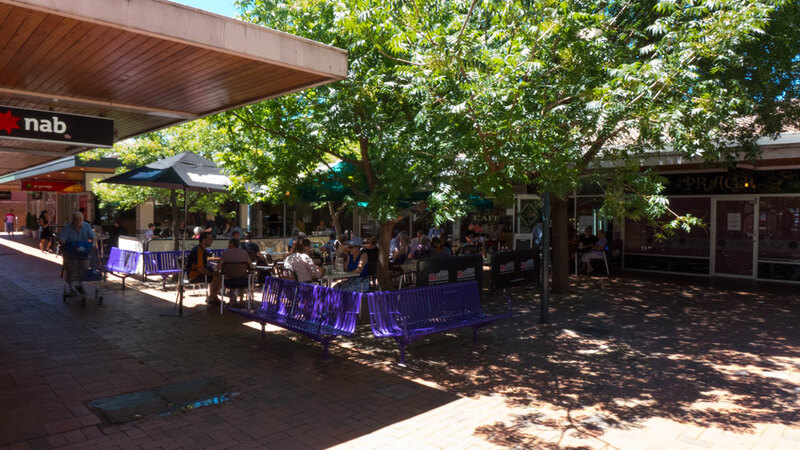 There must be a better way for the ACT Government to handle planning and development.